I would say I really got into Makeup in 2010 however, this is the first time in those 7 years that I have been incredibly excited for a makeup launch (especially a celebrity one). I have very few celebrities I am crazy about but I am nowhere near crazy about their makeup launches or collaborations because I am always sceptical about the quality. 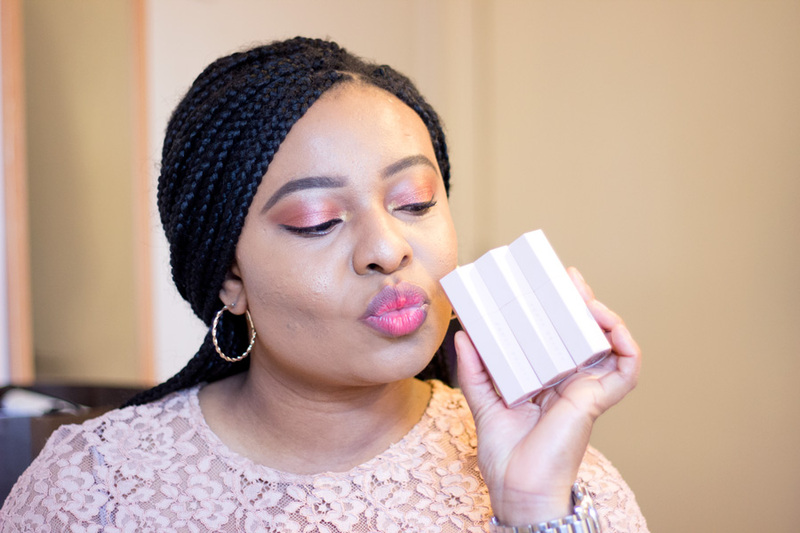 When I saw Fenty Beauty adverts and promotions, I did not even look at it twice because of my previous scepticism about celebrity makeup collaborations. I was slightly curious but I did not think I was going to buy anything as such. However, I was completely blown away when I saw YouTube video reviews and pictures of products (from people who purchased not just the adverts). I told myself- I need (read: not even want but need) all the products in this collection. The first thing I was impressed by was the huge range of foundation shades available- forty in total. I told myself I will need to pick up at least the foundation. When I watched the YouTube video reviews, I told myself "Okay scratch that, I need the entire collection". The thing I love about video reviews is that you see the product in action and make a decision for yourself. I was tempted to purchase online but I decided to pop into Harvey Nichols to purchase some products instead. I thought it will be a straightforward process; I could not have been further from the truth. I don't know why no one is talking about the ridiculous queue that you have to endure to get in but I have to say it is totally worth it. You know what, let me just address the queue and my purchasing experience in a separate heading because it totally deserves it. I am sure no one needs any further introduction to what the brand is all about but I will still summarise it. 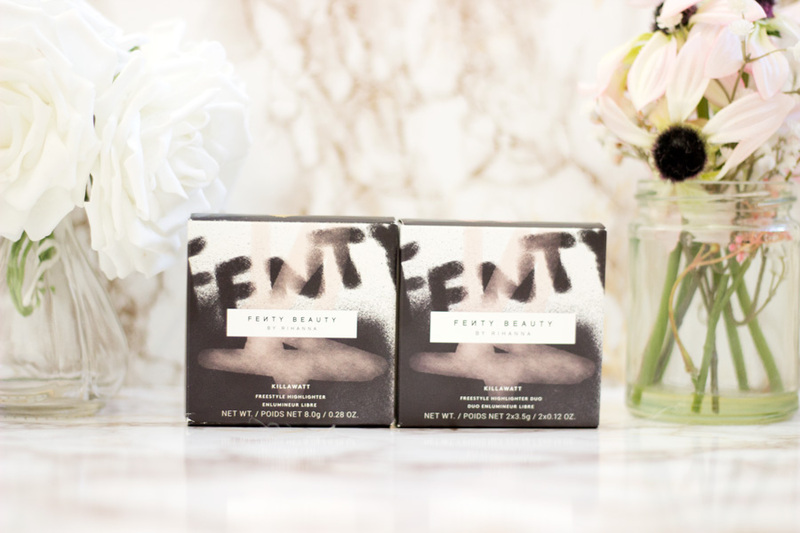 Fenty Beauty was founded by Rihanna Fenty who is an incredible music artist and has won several awards. She is also known for her amazing radiant skin, makeup and great fashion style. 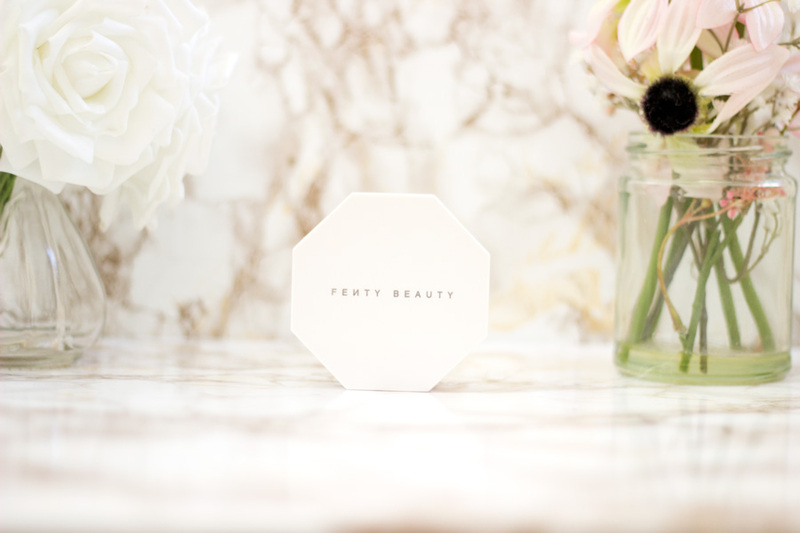 Fenty Beauty is named after her surname (Fenty) and it is also co-owned by Kendo brands (an LVMH owned beauty developer).They specialise in co-developing other great beauty brands including Marc Jacobs Beauty, Kat Von D, Bite Beauty, Ole Henriksen, etc and they have such great quality. 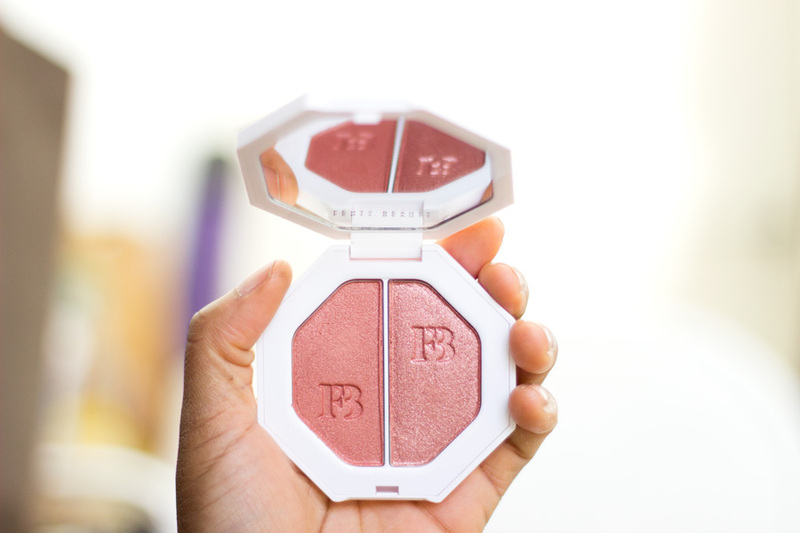 The great thing about Fenty Beauty is that you can tell that Rihanna put in a lot of effort in the development of this brand. 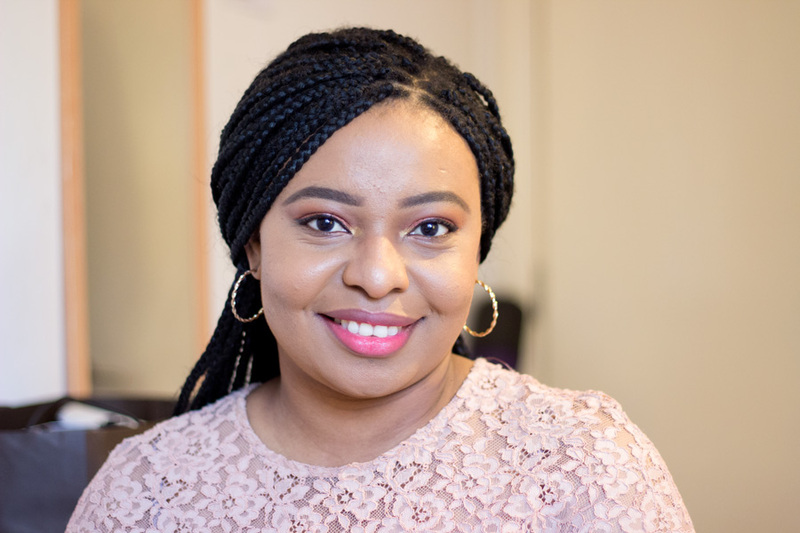 Her vision was to create a beauty brand that all women from all complexions and skin tones could feel beautiful in. 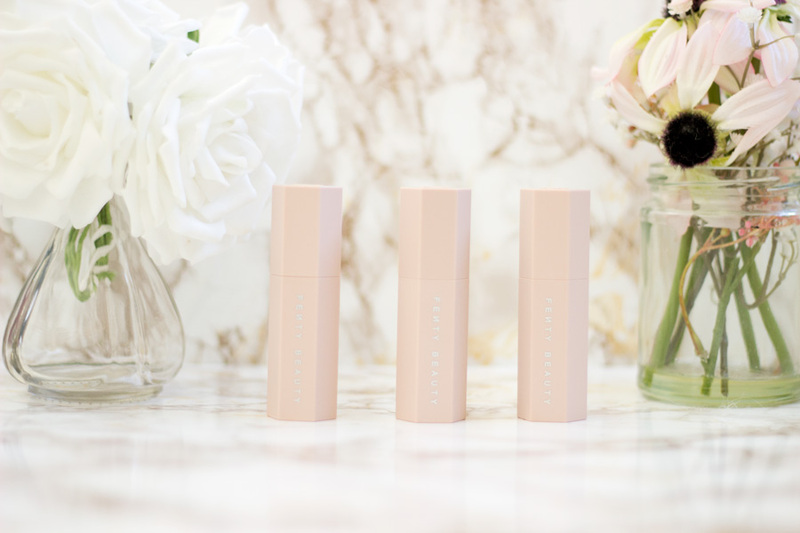 It is not just a situation where she just stamped her name on the brand at all; she put in tremendous work into the brand and it shows in the quality of the products. 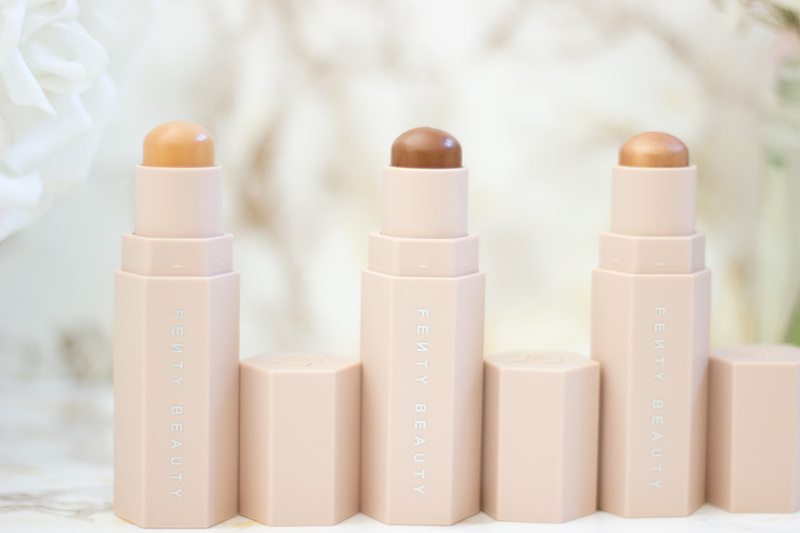 Fenty Beauty particularly stands out because they released forty shades of foundation to suit as many skin tones as possible. 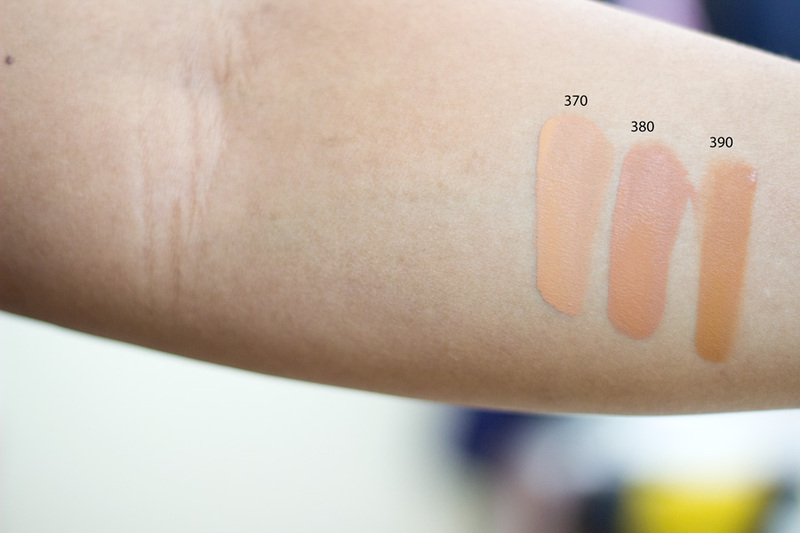 I have seen a few tweets from other brands saying "oh we also have 40 shades of foundation" but I think they are missing the point and here is why. 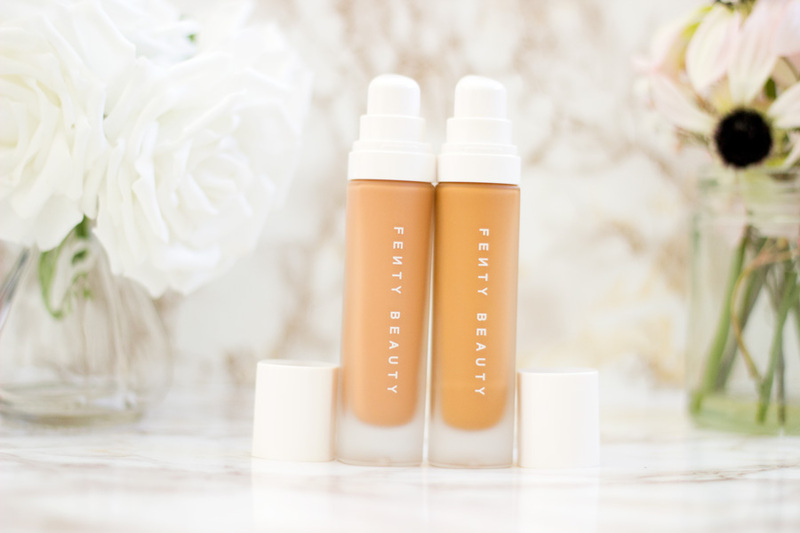 First off, I believe Fenty Beauty is the first brand (as far as I know) to release forty shades of foundation in its first launch. I don't know of any other brand that did that on their first launch. They may have expanded their range so they now have forty but it was not the case from the beginning. 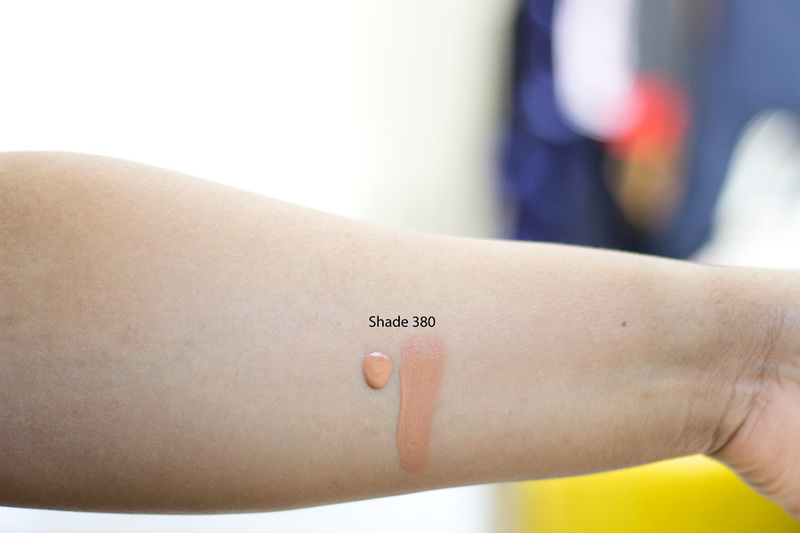 Secondly, these forty shades cover a wide range of skin tones. 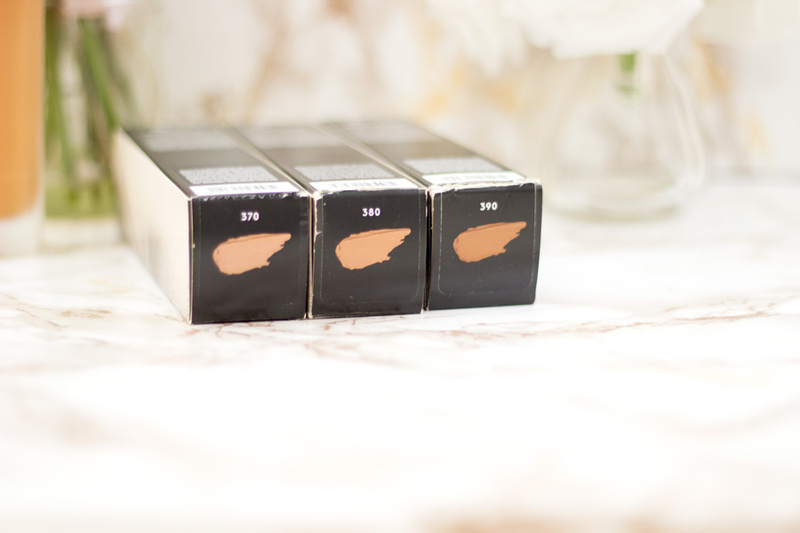 For example, the foundation shades are split into four categories - Light, Medium, Tan and Deep. There are ten shades in each category and the shades are progressively linear so they don't skip shades and jump to bizarre shade. 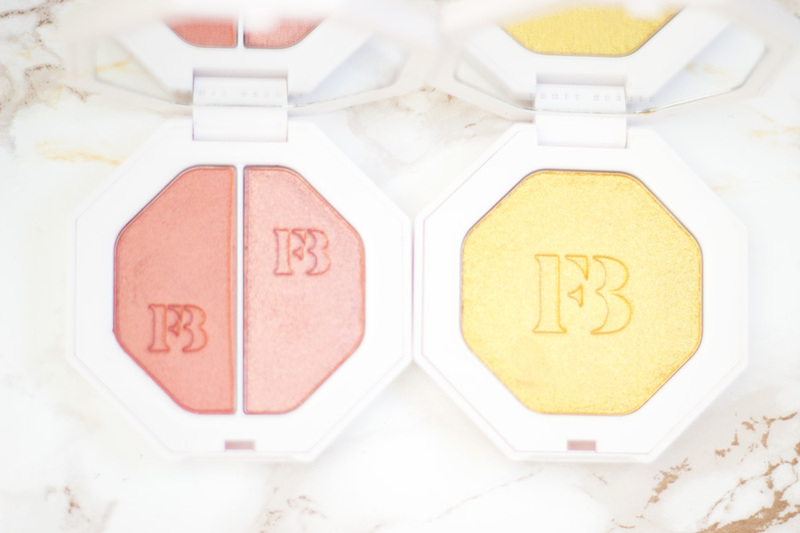 Fenty Beauty has quite a good lineup of products and they also come in a variety of shades which is actually incredible. They have the following products: Pro Filtr Soft Matte Instant Retouch Primer, Pro Filtr Soft Matte Longwear Foundation, Match Stix Trios, Match Stix Shimmer Skinstick, Match Stix Matte Skinstick, Killawatt Freestyle Highlighters, Killawatt Freestyle Highlighter Duo, Glossbomb Universal Lip Luminizer, Invisimatte Blotting Powder and Invisimatte Blotting Paper. The brand also boasts of a good Portable Highlighter Brush 140, Portable Contour & Concealer Brush 150, Full Bodied Foundation Brush 110, Cheek Hugging Highlight Brush 120, Portable Touch Brush 130, Precision Makeup Sponge. In total, I believe there are over 80 products (i.e. with the various shades including the 40 shades of foundation). I am just in awe and I still want to add more products to my collection. I am not sure why no one who has reviewed this brand has talked about the queue one has to endure if you are purchasing from Harvey Nichols in London. I am guessing most people purchased online, went to the product launch or maybe purchased from other branches of Harvey Nichols in the UK apart from the London one or from Sephora. 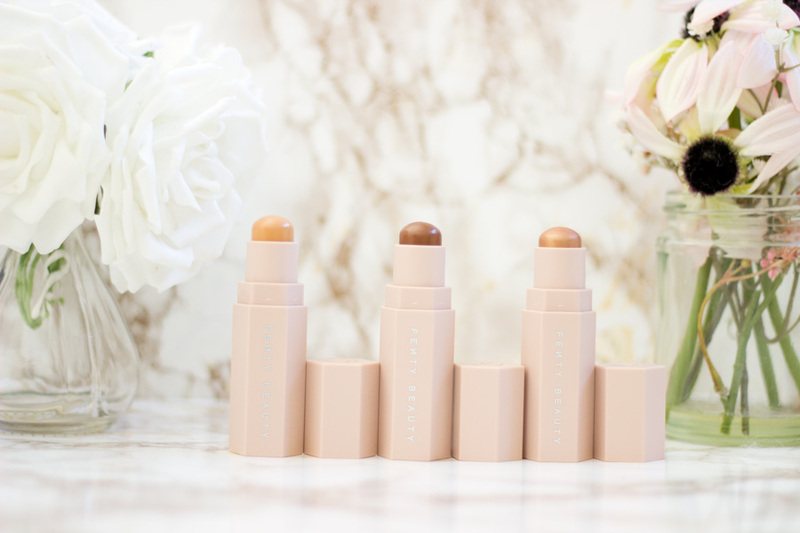 Harvey Nichols is the only place you can currently buy Fenty Beauty in the UK. I knew there will be a little crowd but nothing prepared me for the ridiculous queue that I met the first day I attempted buying from this brand. I strolled in gingerly to Harvey Nichols from the Knightsbridge station with my flatmate/close friend and was absolutely shocked when I saw a long queue. At first, I thought maybe it was a queue to see Rihanna (she was not there, mind you). I was telling my friend it will be nice to see her but I am not prepared to queue at all; I just want to purchase the products. I never in a million years dreamt it was the queue to purchase the products. I was astounded when I got close to the counter and was told I had to queue. Wow!! I didn't bother on that day because it was a Sunday so I said I'd come back the next day after work. Big mistake!! I came back the next day and the queue was already stretched to the second entrance of Harvey Nichols but I decided to just queue this time because my curiosity levels had peaked. To cut the long story short, I queued for 2 hours. The funny thing was the queue was moving and well managed. When I finally got in, I realised why the queue was worth it. I was handed over to a dedicated Makeup Artist who devoted so much time in helping me pick amazing products. The lighting in Harvey Nichols is not the best so I'd advise going during the day so you can pop outside for a brief second to see how the products (especially foundation) look on your skin in daylight. I had such a great experience and I think the way they managed the whole queue was very commendable. The first thing that actually caught my attention was the quality and the design of the packaging. 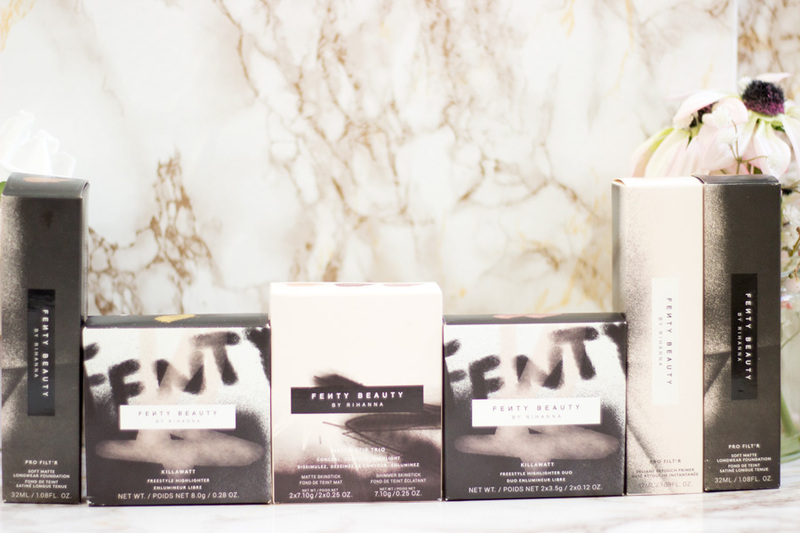 Fenty Beauty packaging is the epitome of chic packaging with a twist. 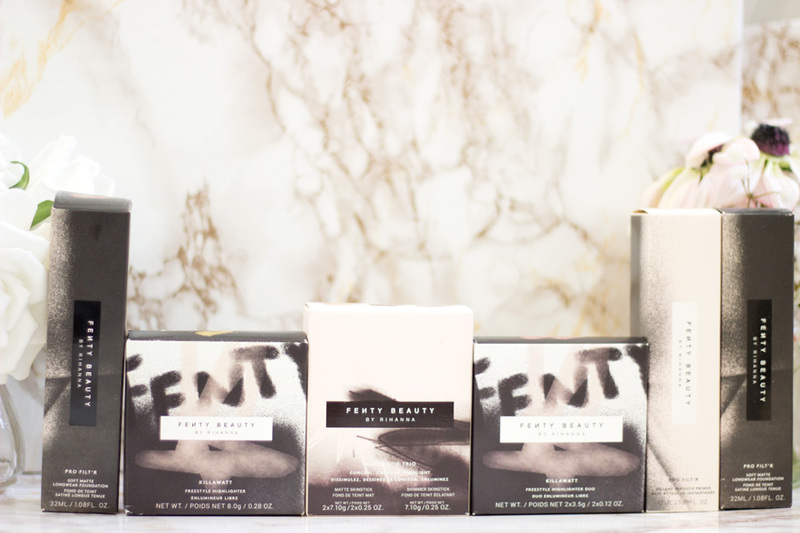 The outer packaging has a monochrome design with Fenty all over it similar to a graffiti-like design. I love how you can feel Rihana's personality through the packaging. The foundations come in frosted glass bottles with a pump and white lid. 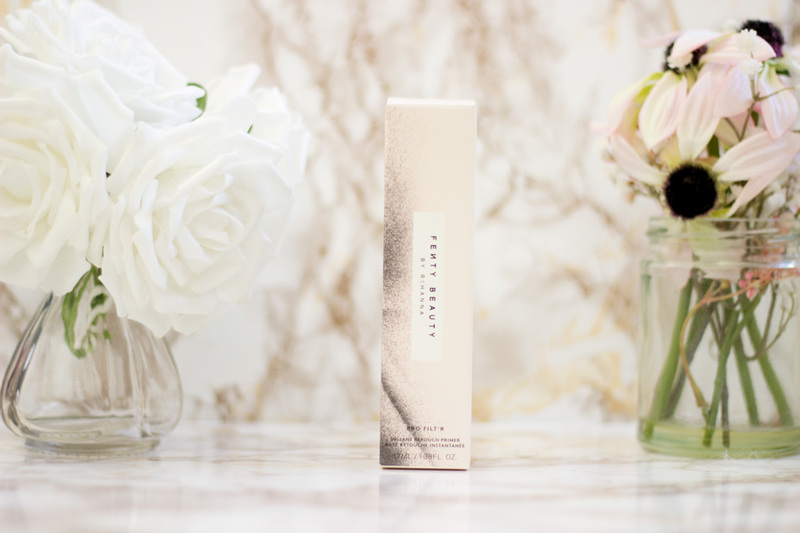 The primer comes in a similar frosted glass bottle, nice pump and beige-pink lid. The Match Stix have the most exciting packaging in my opinion because they are magnetic and I can't tell you how many times I play with them. They are also a similar beige-pink shade (love, love this colour scheme) with a click lid. 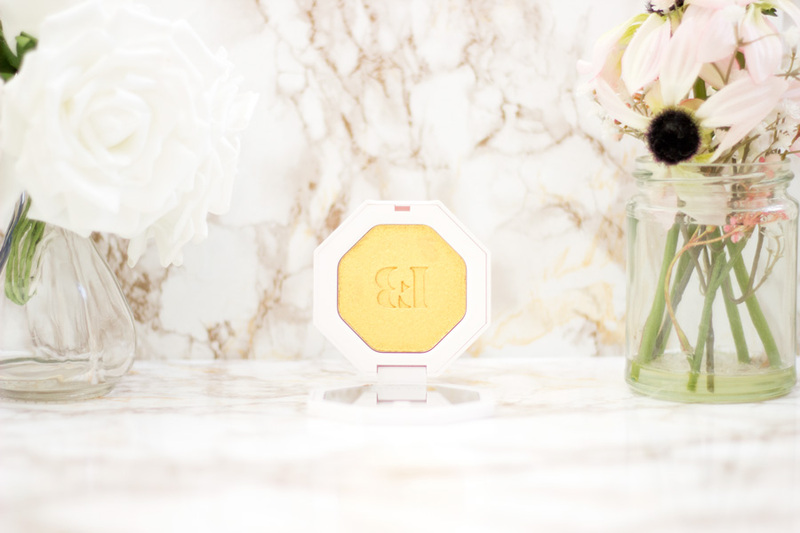 The Killawatt highlighters come in white octagonal packaging with a mirror which equally looks so chic.They look pretty on my dresser, in my Muji acrylic makeup drawers, my makeup bag,etc. They are also so aesthetically pleasing especially if you love taking photos of products like me. I had a nice little list on my phone of all the products I wanted to try out. I tried to stick to a budget and purchase only products that were high on my priority list and I think I did well. I still have more products I want to try because I have been incredibly impressed with the range so that will be my payday treat. 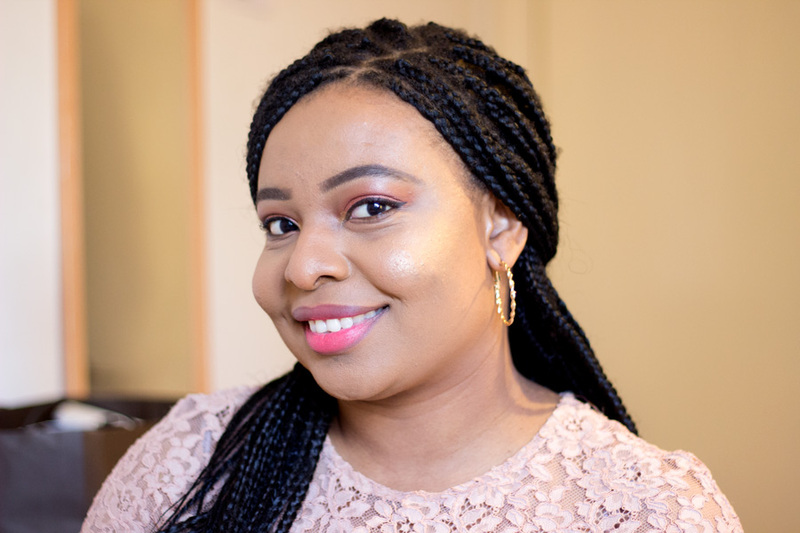 I got the Pro Filt'r Soft Matte Instant Retouch Primer, Pro Filt'r Soft Matte Longwear Foundation , Match Stix Trios (Caramel, Truffle and Rum), Killawatt Freestyle Highlighter (Trophy Wife) and the Killawatt Freestyle Highlighter Duo (Ginger Binge & Moscow Mule). They cost a small fortune to me because I bought them all at once however, I believe their individual prices are reasonable especially for the quality you get. 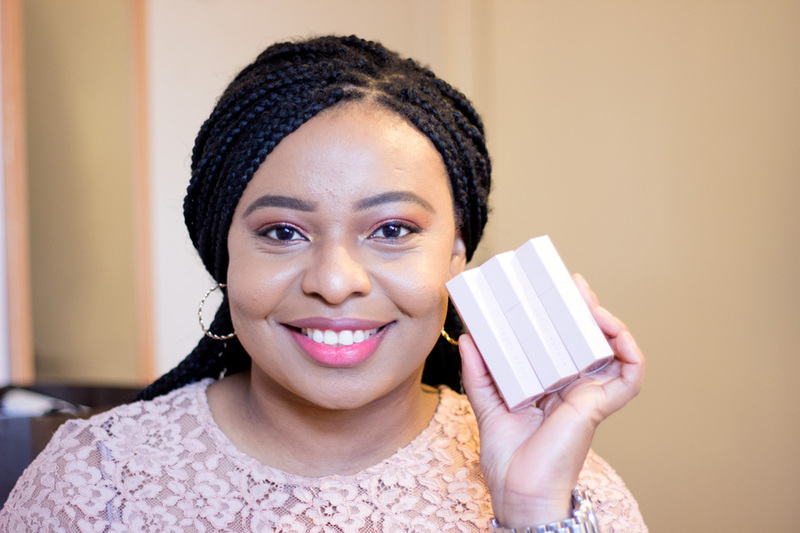 I already have another list of products I want to try including the Matchstix Shimmer Skinstick, Invisimatte Blotting Powder, Universal Glossbomb and a few of the Brushes and Tools particularly the Beauty Sponge. I already mentioned that it comes in a frosted glass bottle which I love and it contains 32ml of product which is more than most regular primers. 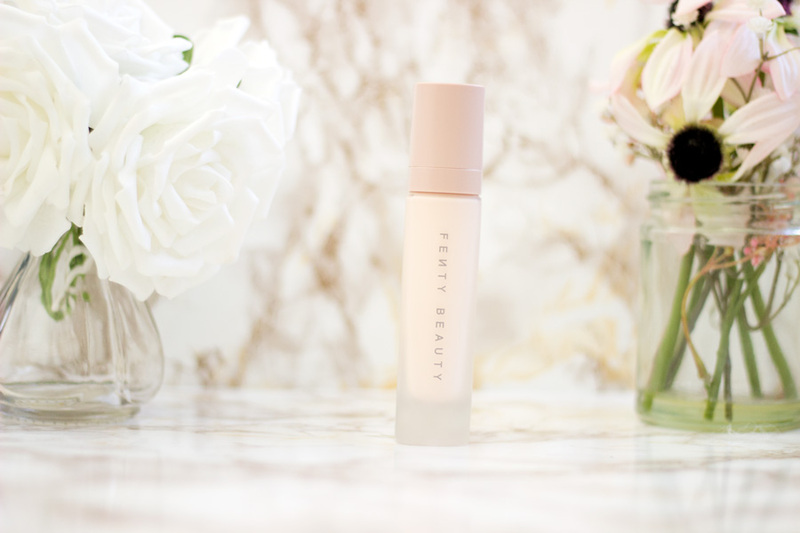 Fenty Beauty describes this primer as a shine stopping, pore diffusing primer that smooths the way for better foundation application and wear time with an instant retouch effect. 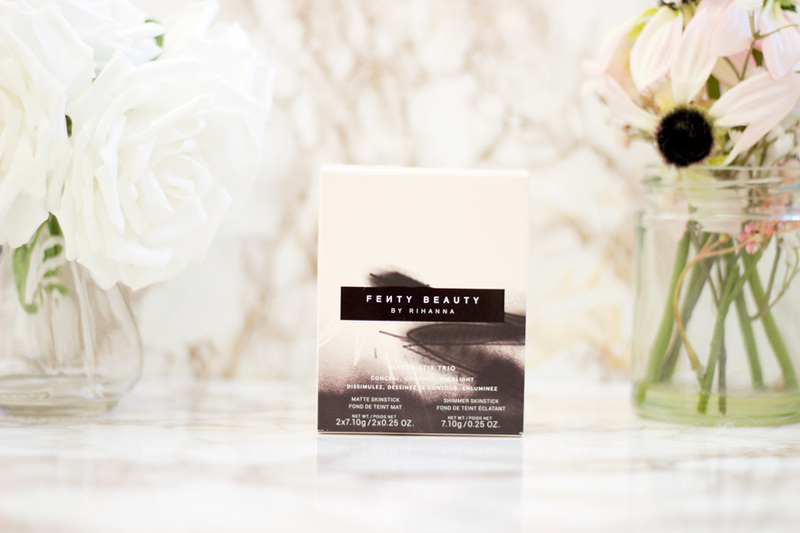 I was more than ready to get my hands on this because the above qualities are what I look for in a primer. I want my skin to feel smooth, the appearance of my pores diminished and my foundation/makeup lasting longer. The texture does not feel like any primer I have tried rather it almost feels like a moisturiser. It feels hydrating and sinks in pretty easily. 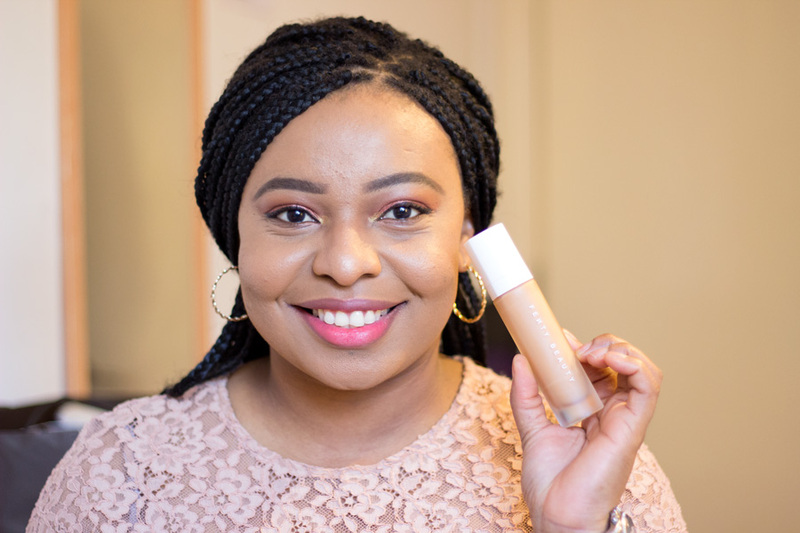 It has a light beige/pink colour but it does not mess with the colour or application of my foundation; if anything it works even better with the foundation. Shine Stopping- it really controls my shiny T-zones and I don't need to blot until around 4-5pm which means it holds up pretty well. I totally agree with this claim. 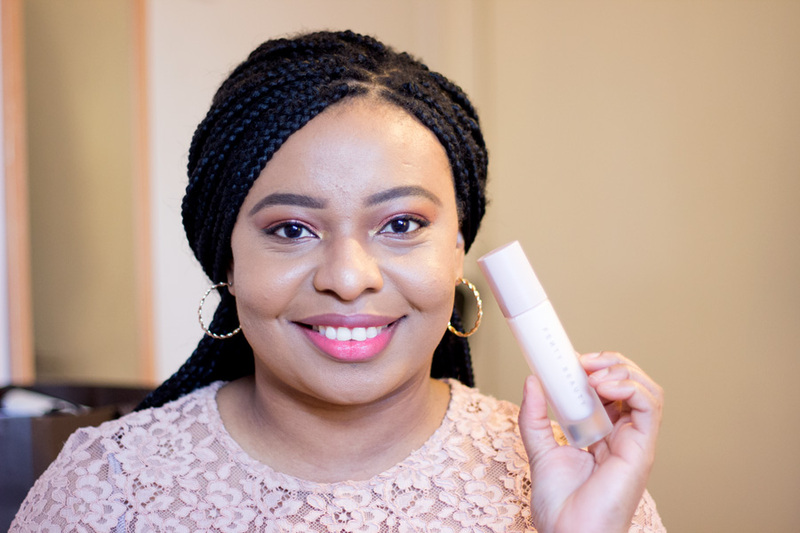 Pore Diffusing- On its own (assuming you wanted to wear it without foundation), I would not say I noticed an instant pore blurring effect but it became more obvious after applying the Fenty Beauty Foundations (and other foundations too). 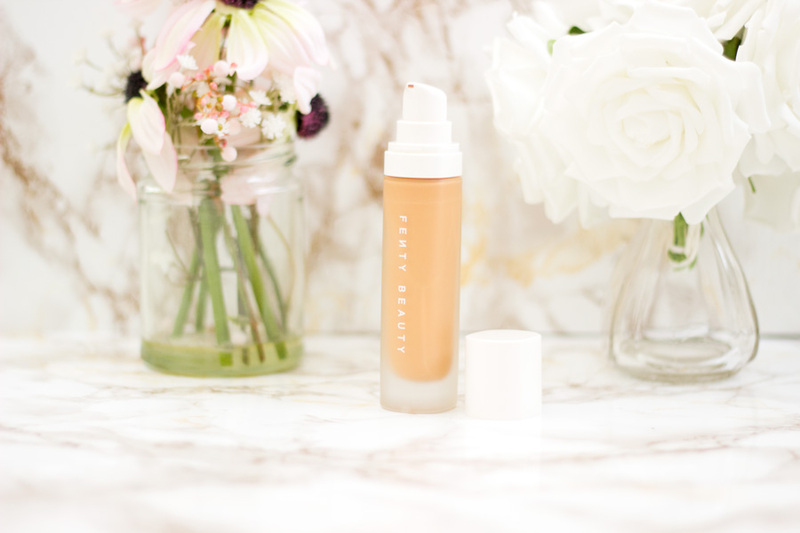 Better Foundation Application- I totally agree because my foundations (including the Fenty Beauty Longwear) glide on so smoothly. 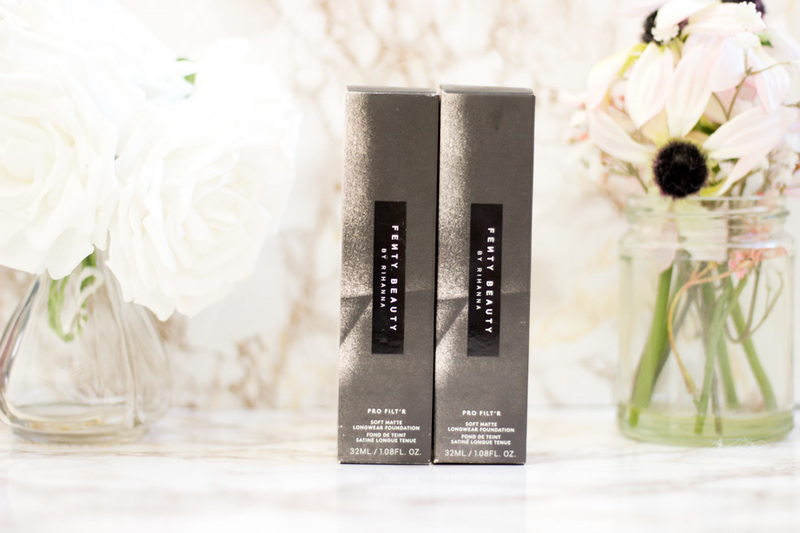 I have tested this primer out even with naughty foundations that are difficult to work with and yet I still got great results,. Wear Time- This will be a long green tick for me because my makeup always looks so natural, fresh and lasts pretty much the entire day until I get home. I would highly recommend giving this a try and I am so delighted I have got 32mls of it. It will last forever because I use a small amount. It has been a pretty long time since any foundation knocked me off my socks and it feels refreshing to finally own one again. 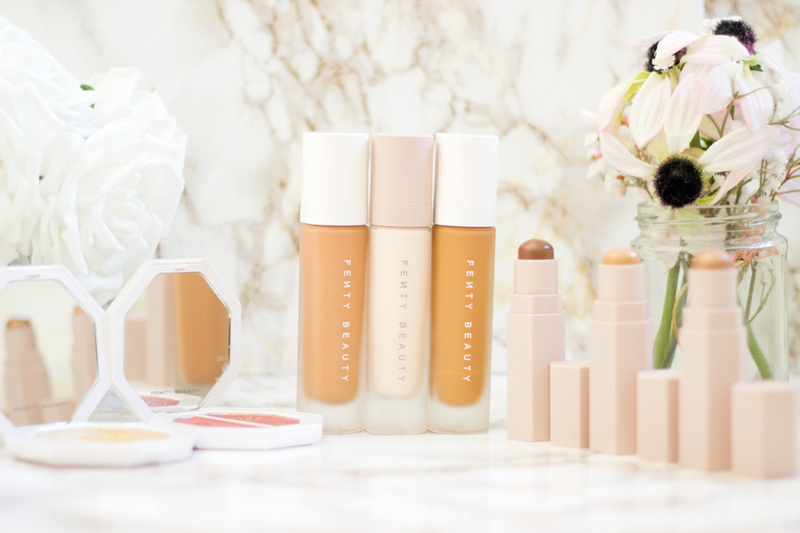 For foundations, I look out for an exact shade match (with the right warm undertones), good coverage, demi-matte or soft matte and long wear time. 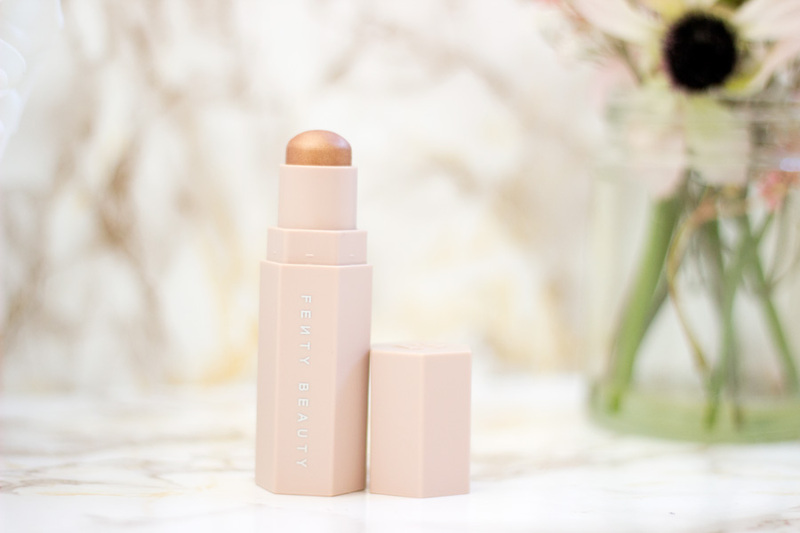 The Fenty Pro Filt'r Soft Matte Foundation ticks all these boxes and more. It comes in a chic frosted glass bottle with a pump and costs £26 which makes it really decently priced. It also contains 32ml of product compared to the usual 30ml which many products come in. I could do a whole post on this foundation because I am in love with it. It has quite a liquid texture so it is likely to run across your hand when you are preparing to apply it. The bottle says to shake well before use and that's exactly what I do. 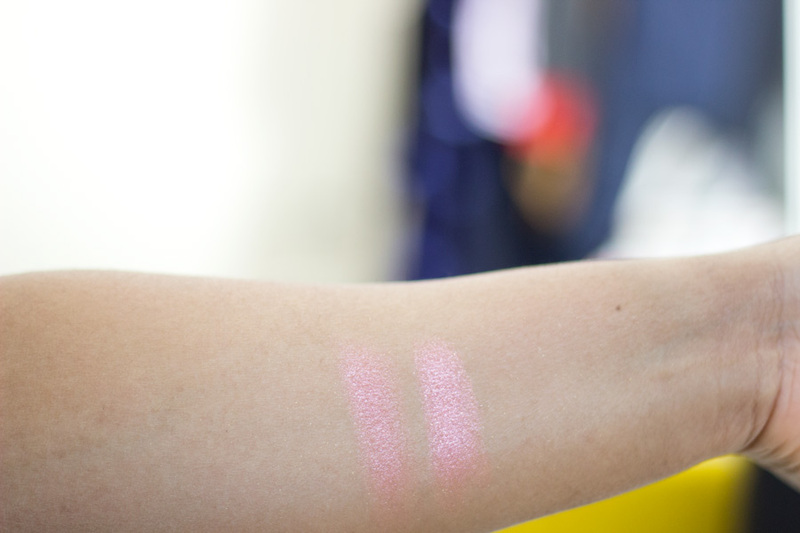 I got two shades initially which I swatched and realised they were not the best for me especially now that we are heading into colder months. 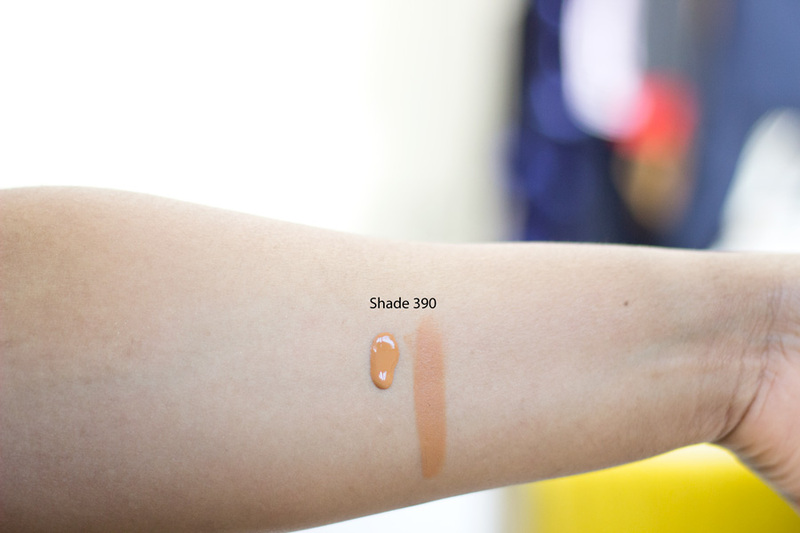 My actual shade is 370 which has a warm undertone and it matches my skin so well. It dries to a very natural demi-matte finish (regardless of how many layers) and I love the wear time. Whenever I catch a glimpse of my face while at work, I expect to see my T-zone shine trying to take over. However, that's not the case at all instead my face has a natural glow. 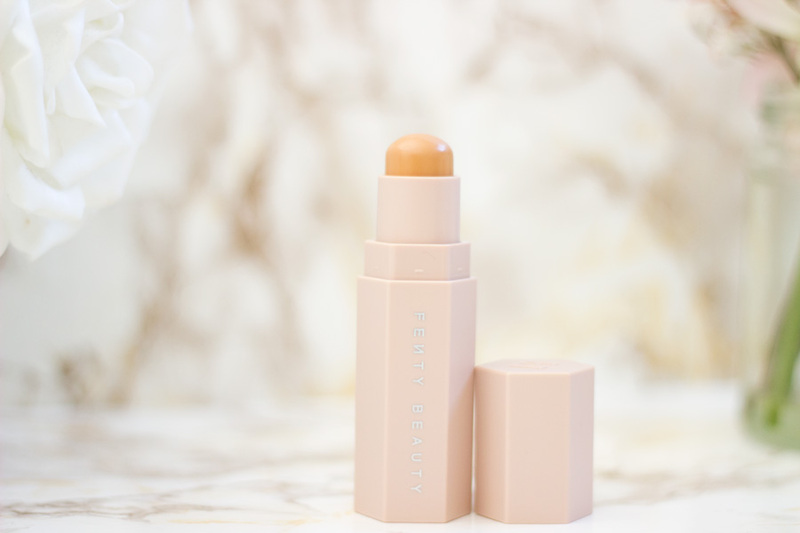 It is my current favourite foundation (well since this week). I am absolutely in love and obsessed with it. 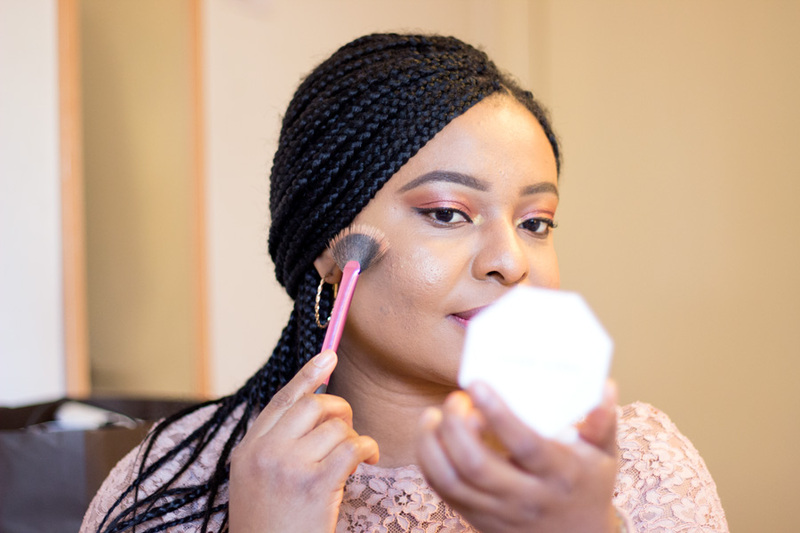 It can be applied with a flat foundation brush (including the Fenty Beauty one), Beauty Blenders (including the Fenty Beauty version), a Buffing Brush or any brush you like. 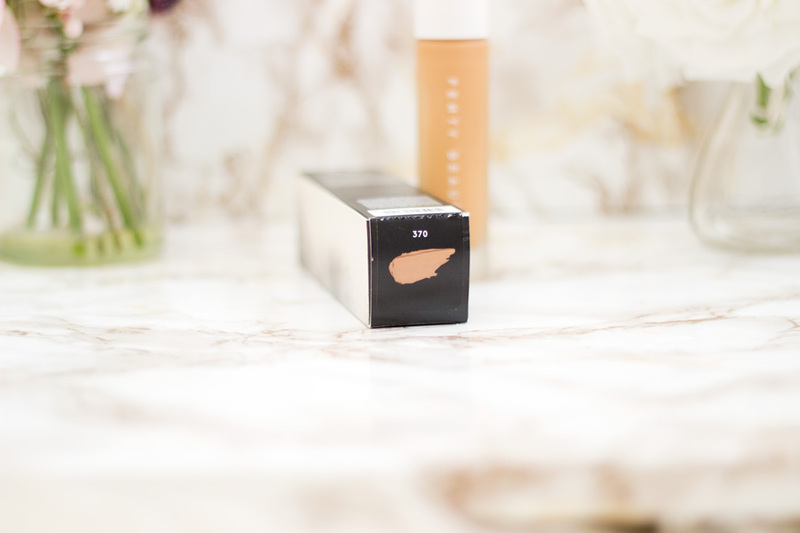 I love the application because it blends in so smoothly and glides easily across the face. I prefer to use my Real Techniques Buffing Brush or Sephora Multi Task Brush and I noticed that the Beauty Blender gives a lighter coverage compared to my foundation brushes. I usually start off with a few dots all around my face especially in areas where I have hyper-pigmentation. I use tapping motions initially and then blend it out to a smooth finish. One layer gives you decent coverage which still looks natural but a second and even third layer provides really good coverage. I no longer have to bother with a concealer for my hyperpigmentation because it provides great coverage. 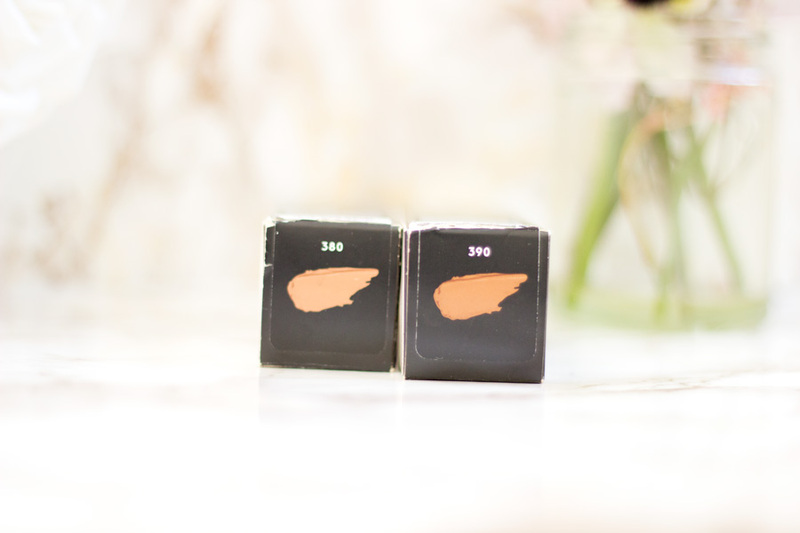 The first two shades I got were- Shade 380 (cool toned) and Shade 390 (warm toned). Harvey Nichols don't accept returns so I am selling both of them (details below). Update- I have already sold 380. I find that if you go by the colour of the foundation from the bottle you may make a mistake in choosing the right shade. I already mentioned that the foundation bottle is made from frosted glass so the foundation may appear lighter than it is on the bottle. 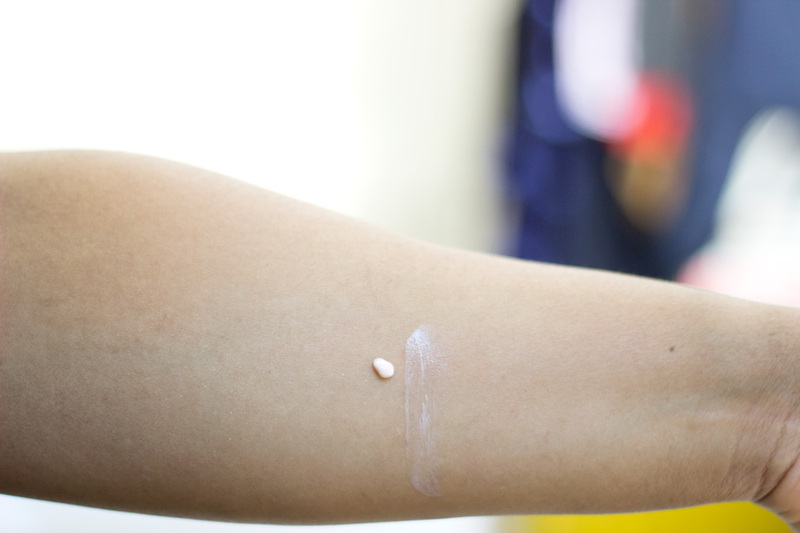 Another thing to bear in mind is that the foundation sets to a slightly darker shade than when it sets so if you are in store to buy let it set and check out the colour in sunlight. 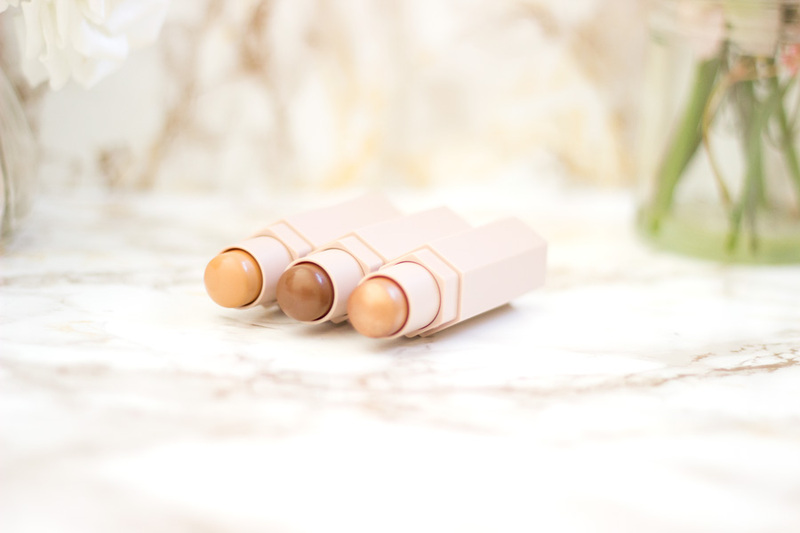 Fenty Beauty describes this as a trio of long wear light-as-air makeup sticks which are curated by skin tones with two matte Match Stix to conceal and contour and one Match Stix Shimmer to highlight. 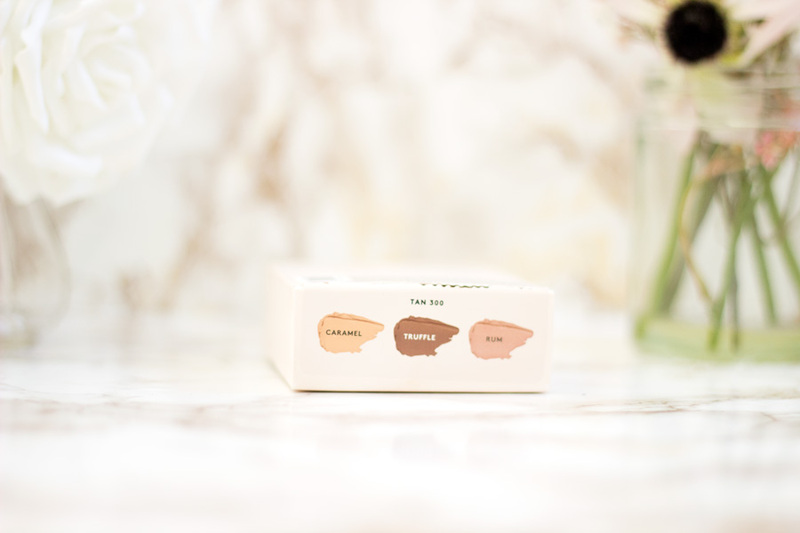 I chose the shade Tan which is a perfect match for my complexion and I am so delighted they put together this trio as you save more money compared to if you buy them separately at £21 each. 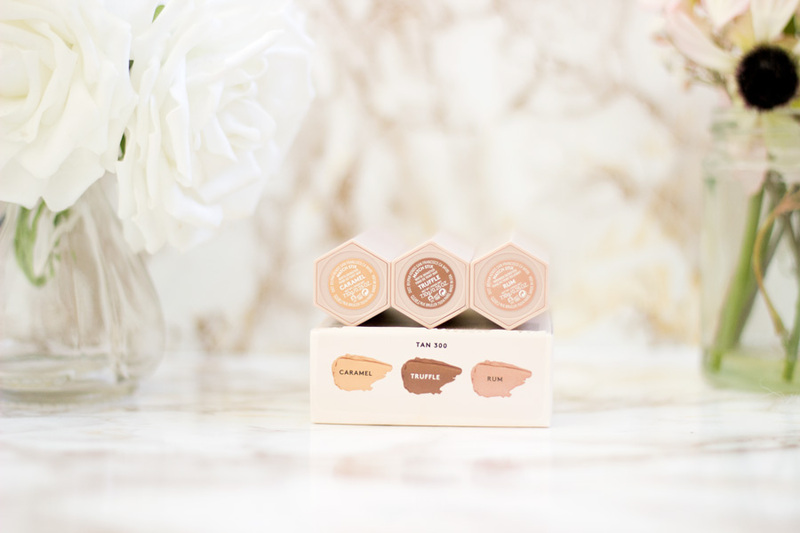 The Tan Trio contains 3 products: Caramel (Concealer- Matte), Truffle (Contour- Matte) and Rum (Highlighter- Shimmer). I usually shy away from buying sets of anything because there is always one product that does not work for me but that's not the case with this set. Everything is so perfectly curated for my complexion and I love all the products. I am not a fan of cream products because they tend to shift or destabilise my foundation when I apply them. I also find that my foundation makes a mess on the cream products via transfer and I have to clean it thoroughly after use. However, this is the very first time I am ever trying any cream product that does not do the above. These products glide on smoothly on my combination oily skin without feeling greasy or heavy even when I have my foundation on. Most importantly, the foundation already on my skin does not transfer onto the product and they still look pristine. I am incredibly impressed by this and I have been using these products non-stop since I got them. 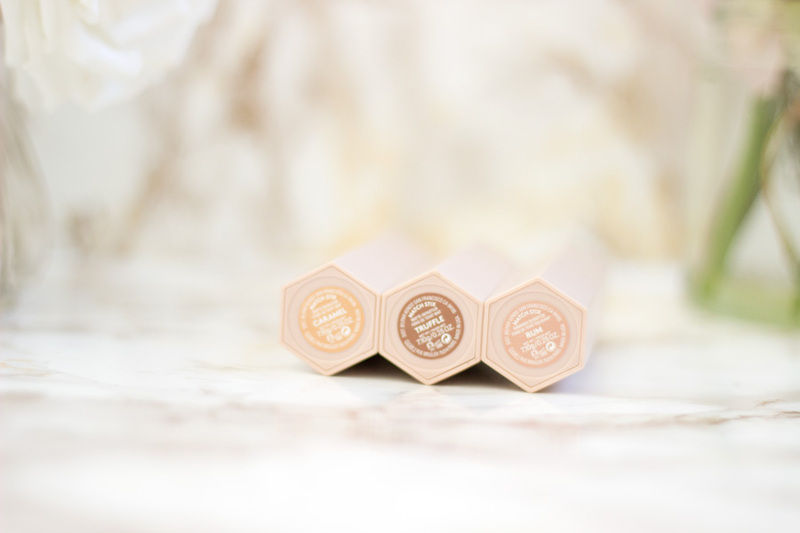 Caramel is a warm toned concealer which I think will be suitable for medium-dark skin tones. I am a MAC NC45 and this works really well as a concealer for my under eye. 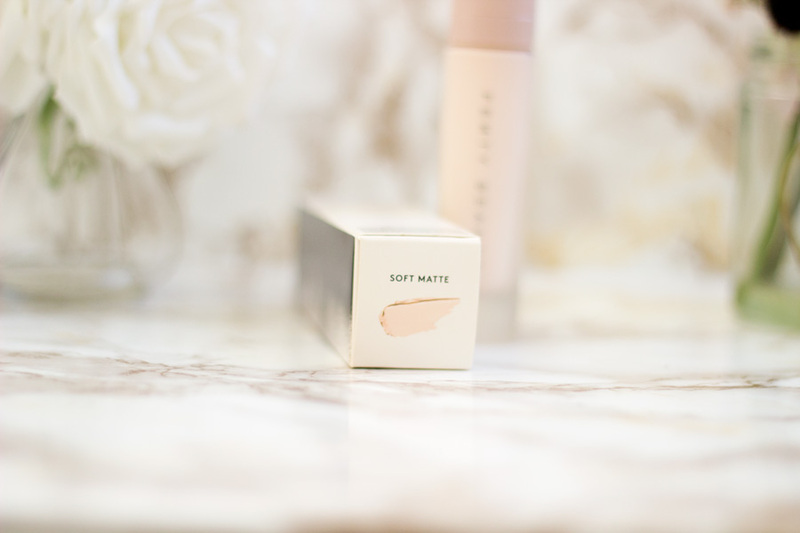 It glides on pretty smoothly under my eye for concealing and I also use it to lightly highlight those areas. 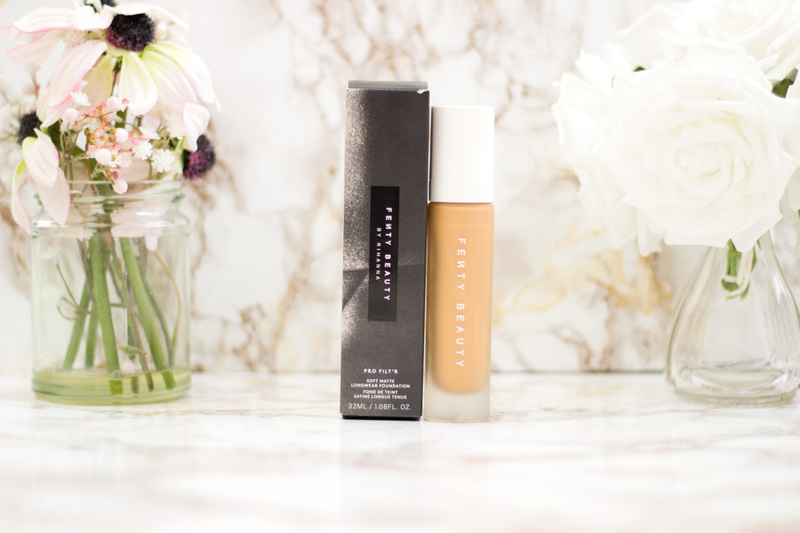 I feel if you have dry skin you may find it a tad dry but this can be combated by using a hydrating primer such as the Fenty Beauty Pro Filt'r Soft Matte Primer or any other primer you may own. It also blends so well and I use my Real Techniques Setting Brush for this. The only issue I have is that it is difficult to get really close to my under eye as a result of its chunky shape. To fix this issue, I use a small concealer brush to pick up some product and apply where I need it rather than straight from the bullet. The best part is there are no dents to be seen on the concealer stick even with a brush. 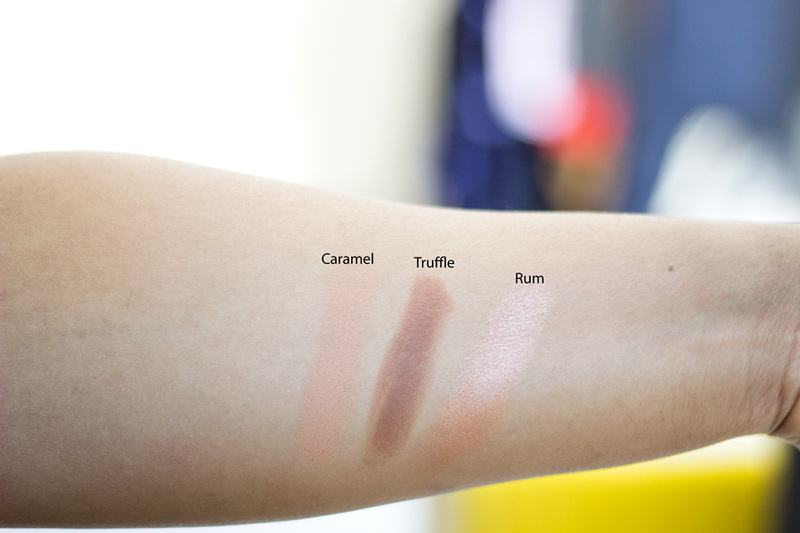 Truffle is a deep brown shade which is perfect as a contour. 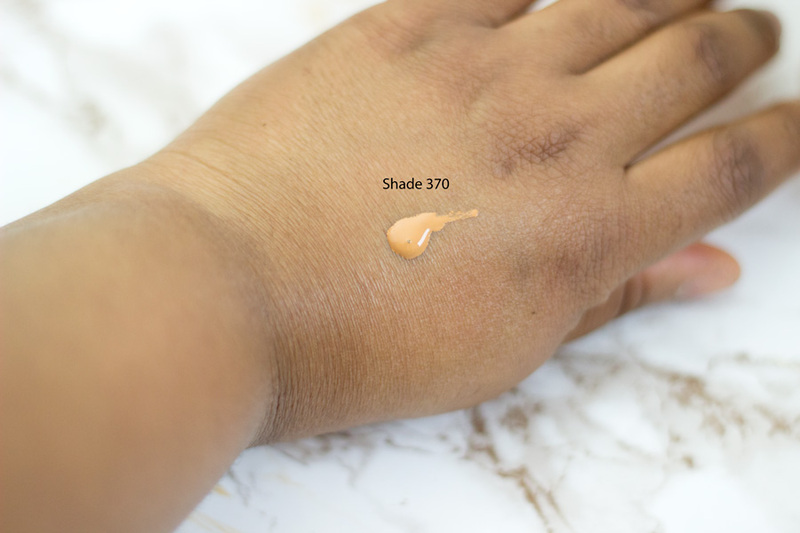 I feel like if you have oily skin or combination oily skin you can get away with using this shade as a foundation (if you have deep dark skin). I have never really had a lot of issues with contour sticks because they are usually a good shade for my complexion. 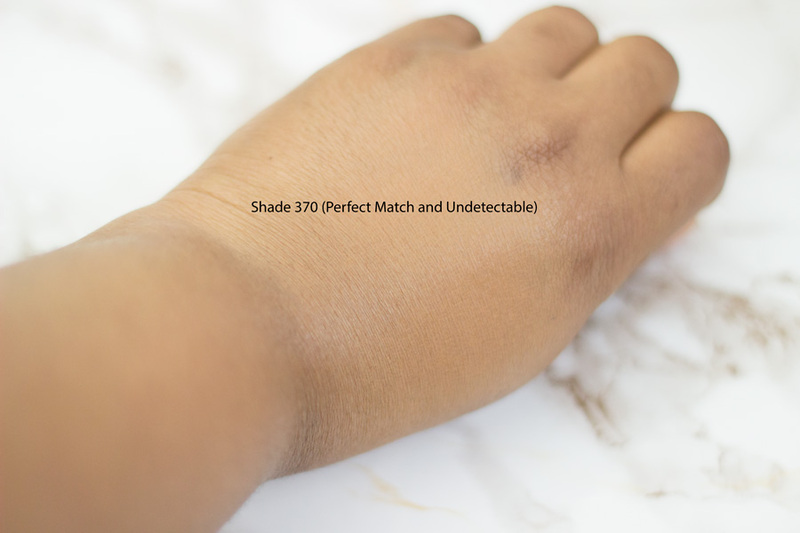 The shade Truffle is more than perfect for my skin tone as it is not too warm, orange or ashy grey. It is just the right balance that can create a good shadow on the face for a contour. I love the way this works with my foundation because it does not move around. It is a smooth application across my cheek bones, blends out smoothly (with my Real Techniques Contour Brush) and stays on all day. For my nose contour, I have to pick up the product with a small brush because it is chunky in shape and I prefer to have a precise nose contour. Nevertheless, it blends out really well and stays put all day. Rum is the only shade in this collection which is shimmer and it has a special place in my heart. I would describe the shade as a rose gold highlight which I think will work well for a range of skin tones. 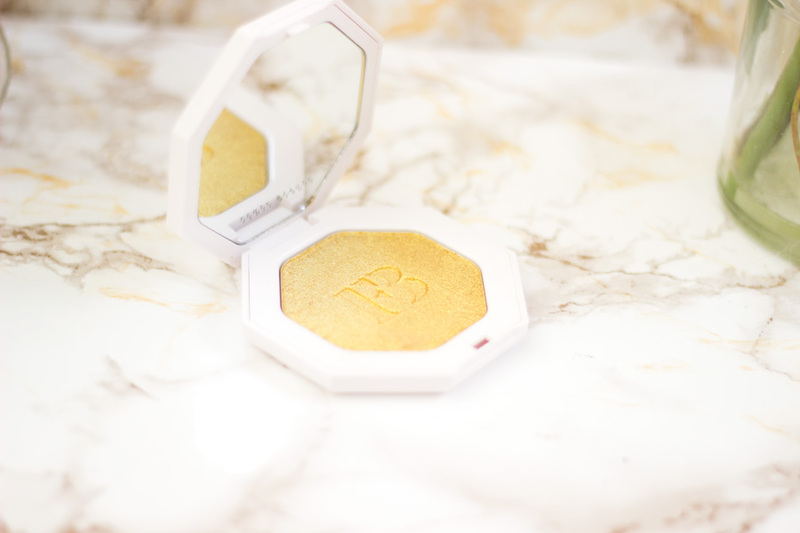 For me, it is the cream highlight I always wanted to own which does not interfere with any other makeup product on my skin. It is great for everyday wear because it gives that subtle highlight and it can also be layered up for something dramatic. 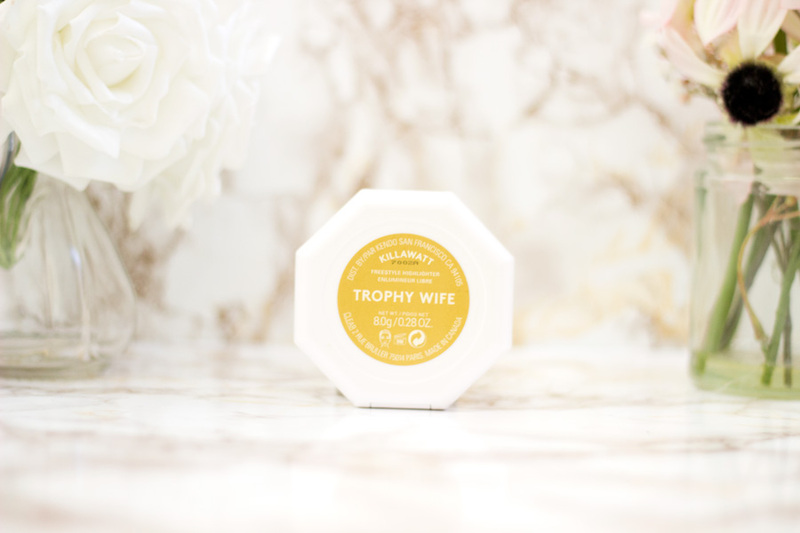 I am sure everyone must have heard about Trophy Wife especially if you are a beauty lover. I honestly thought it will be sold out by the time I was ready to shop but thank God that was not the case. 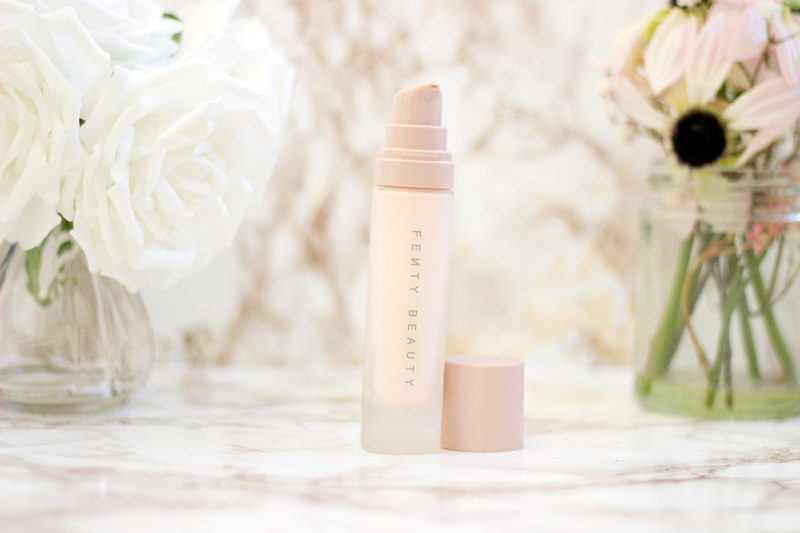 Fenty Beauty describes this as a weightless long cream-powder highligter that range from subtle day glow to insanely supercharged glow. There is also another shade called Metal Moon which will suit lighter skin tones. 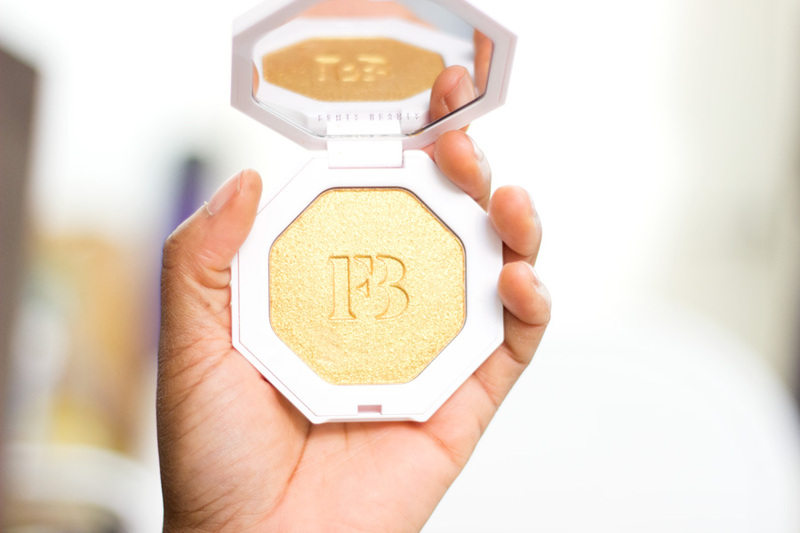 Personally, I feel there is nothing subtle about Trophy Wife because it is insanely pigmented but I am all about the highlight glow. I think this is one of those highlighters that you either hate or love because of the pigmentation. I would describe it as a proper metallic yellow gold shade. It has some shimmer and glitter on it which causes some fallout on the packaging and on your face. I find that the best way to apply it is to use a light fan brush (the Real Techniques Fan Brush is excellent) and lightly pick up some product with a tapping motion (not a swipe motion) and then dust off the excess into the pan. I apply on my face with the same tapping motion and it looks fabulous. With this method, I can build it up if I want to go crazy. 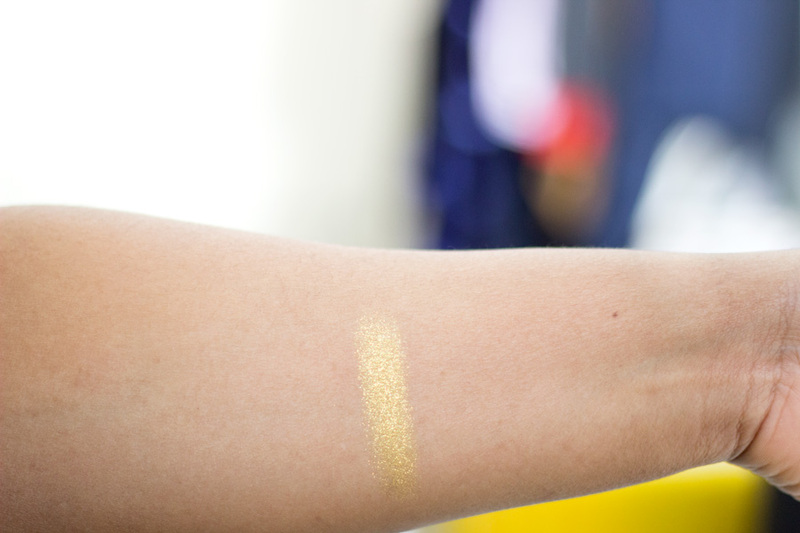 It is one of those highlighters that looks superb and when the sunlight hits it, it just looks glorious. I find it is very long wearing and it does not fade at all. The best part is that it also doubles as an eyeshadow which I love so much. I have a soft spot for Gold eyeshadows because they look flattering on me. I will suggest checking this out if you are in store to see if it is one that will work for you. 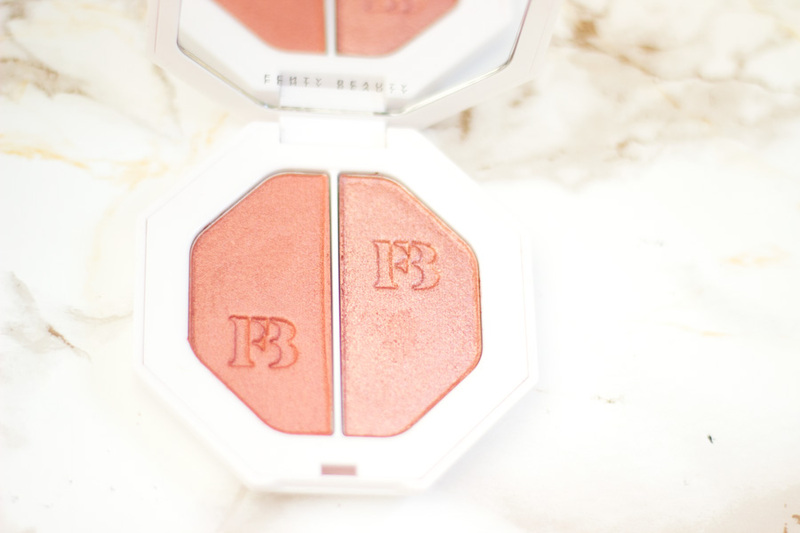 Last but not the least is the Killawatt Freestyle Highlighter Duo which I have to say is one of my favourite products in this haul. Okay, I am pretty much obsessed with all the products I purchased but some are more special than the others. 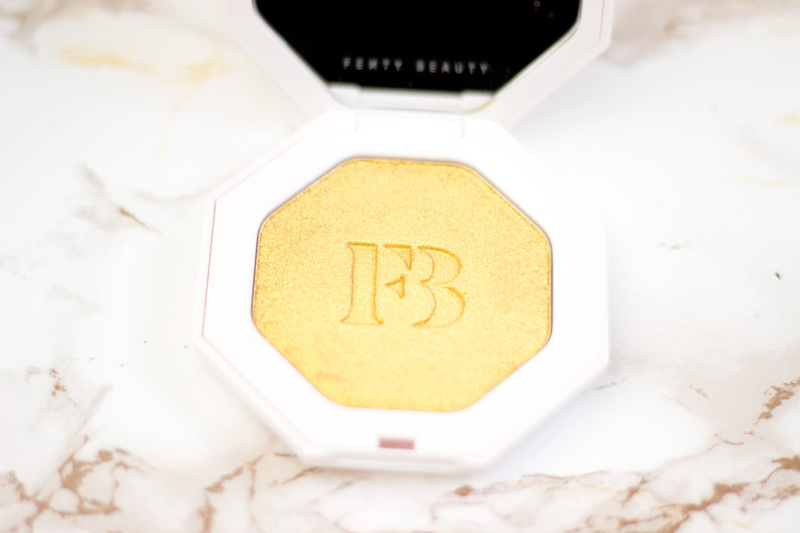 Fenty Beauty describes this as a weightless cream to powder hybrid highlighter which provides a subtle glow or an insanely supercharged glow. 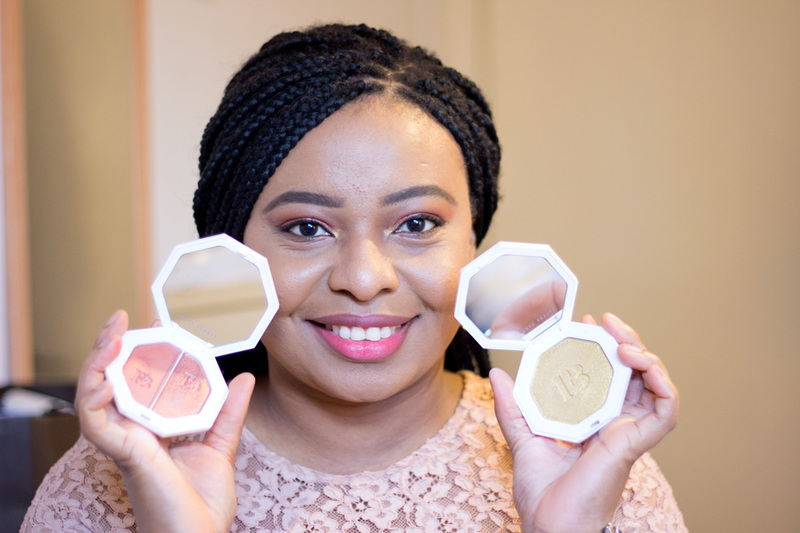 There are four products in the Highlighter Duo range and they suit a wide range of skin tones. I got the shade Ginger Binge and Moscow Mule which is a beautiful warm rose gold shade. 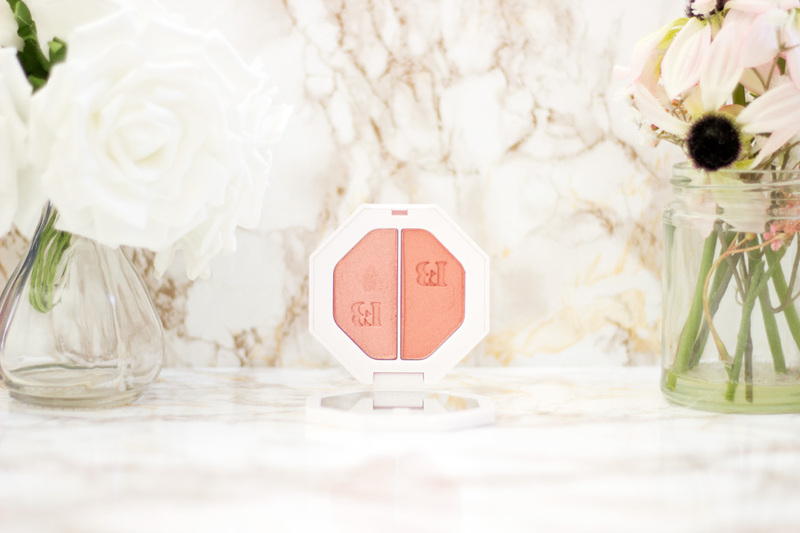 It leans towards a warm pink/rose shade which always looks flattering both as a highlighter, blush and eyeshadow on my skin tone and that's exactly how I use it. 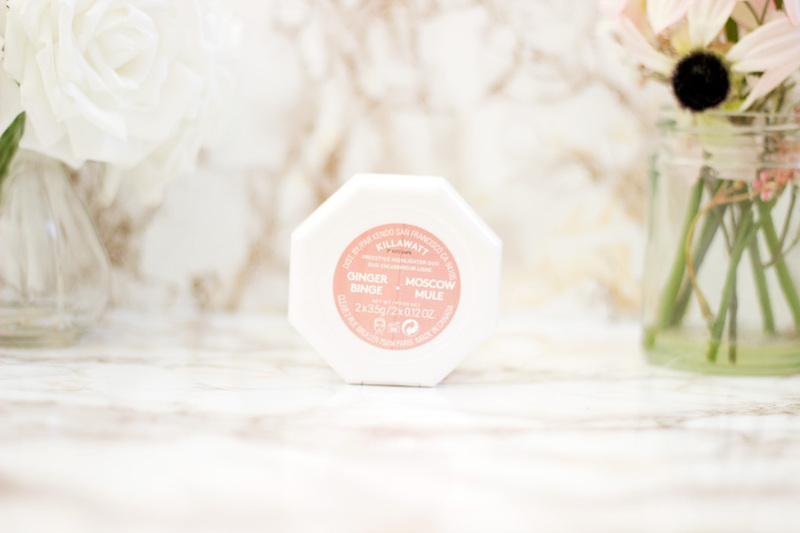 Ginger Binge is a bit more subtle with less shimmer so I tend to use it as a blush and Moscow Mule has a shimmer to it so it works well as a highlighter. Most times, I swirl my brushacross both sides to get a good mix and it looks fabulous. I also use it as an eyeshadow and you all know I love my pinks. It is surprisingly long wearing as an eyeshadow and it does not crease at all. 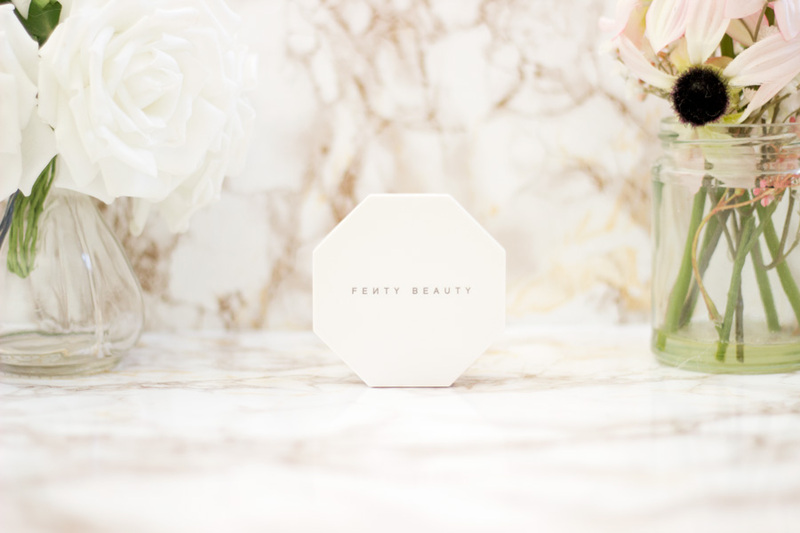 If you live in the UK, the only place you can purchase Fenty Beauty is from Harvey Nichols. You can purchase directly in store (be prepared for a queue if you go to the London branch) or you can purchase online (free delivery in-store, regular delivery is £6 and next day is about £10). I am not a fan of paying huge sums for delivery so for my next purchase I will be ordering online to pick up in store since I currently work in Central London. If you live in the USA (lucky you!! 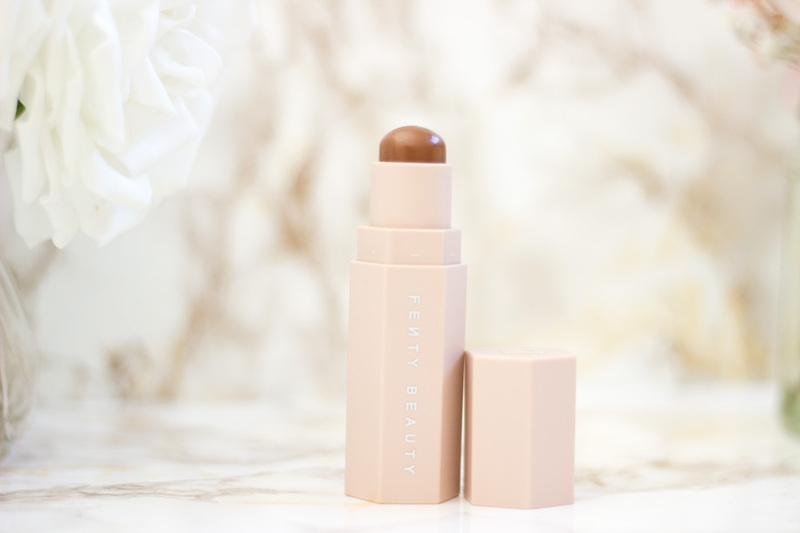 ), you can purchase Fenty Beauty from Sephora and the Fenty Beauty website. I have two other shades of foundation for sale because I could not bear to queue up again if I picked only one. 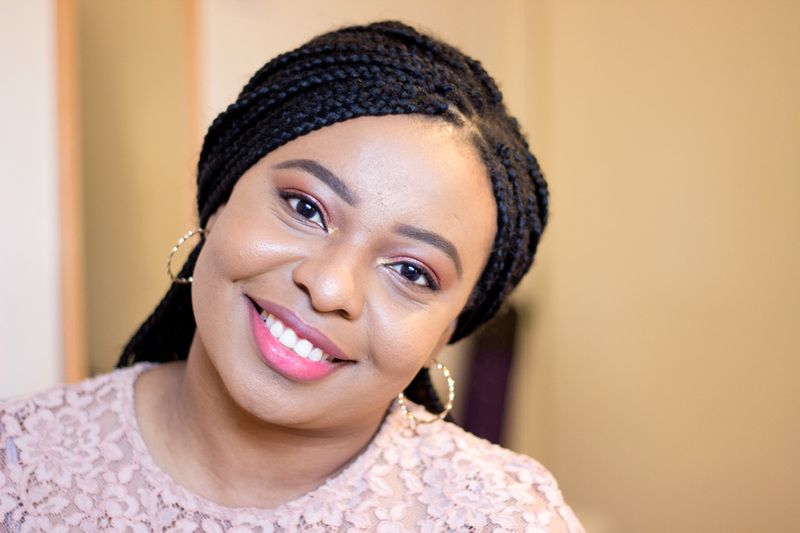 My complexion is not the easiest to match and I find that's the issue when I go to counters but I eventually get there. My regular shade is 370 but I also purchased 380 and 390. If you are interested in purchasing them, send me an email on liv@fashstyleliv.com. They have only been swatched and they are brand new. The packaging seal has been opened to allow me try the products. I am selling for £25. Shipping costs around £3 so let me know and we can work out something. P.S. 380 has already been snapped up so I only have 390 left. As I mentioned earlier, I had no intention of purchasing any product from the range but right now, I have been fully converted. I want to buy the entire collection but of course, my pocket is having none of it. 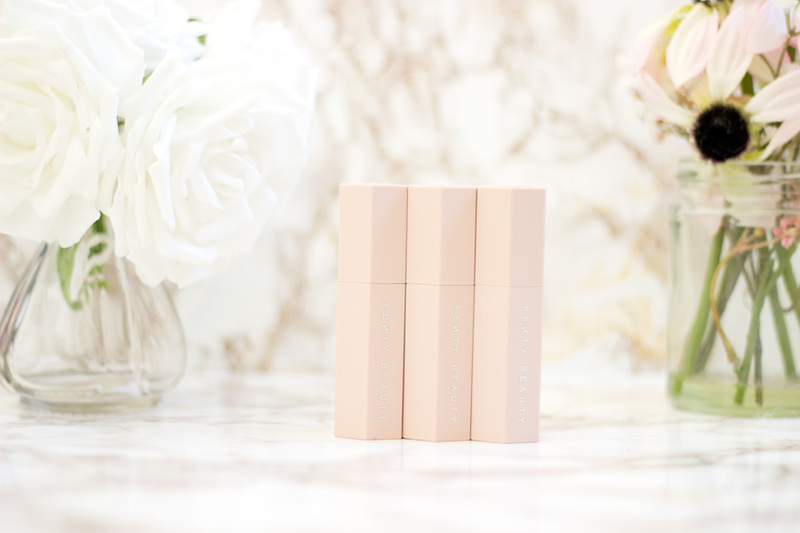 I am hugely impressed with the entire collection and I cannot stop using these products. 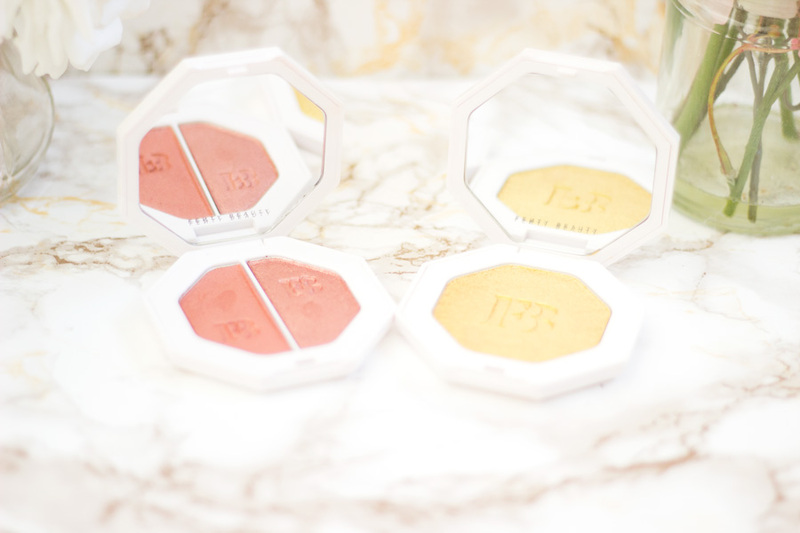 My favourite products have to be the Foundation, Highlighter Duo and Matchstix Trio. I can't wait for Rihanna to expand the range and add in some more lip products, eyeshadows, powders (the range has the universal Invisimatte one but a complexion one will be great) and eyebrow products. I spent a little fortune on these products but I will do it all over again. I definitely need to get a second shade in the foundation for winter but I love the finish for evening wear! I wish I'd picked up the primer now as it sounds great :) I'm really enjoying the contour and shimmer highlight Match Stix at the moment. Great, thorough review!